Priyanka Gandhi Vadra delivering a speech in Ghaziabad on Friday. 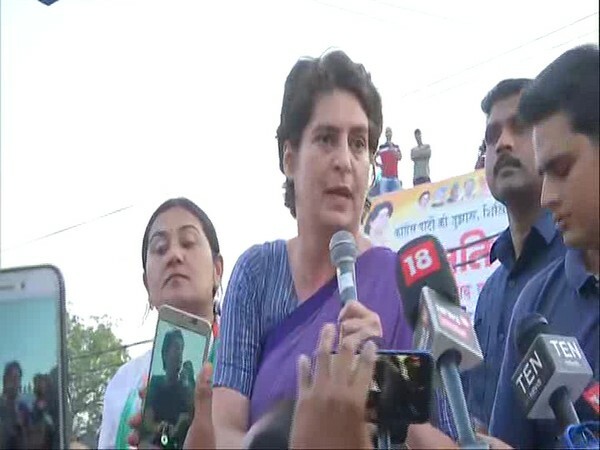 Addressing a public gathering during a roadshow in Ghaziabad, Priyanka said, "Fifteen days back I went to Varanasi, I had thought that the Prime Minister must have worked hard in his constituency. I asked people has he come here? I was told he does come but only gives speeches and leaves. They told me that he does big rallies and leaves". "I was surprised that the Prime Minister didn't get even five minutes of time to visit a family in any of the villages of his parliamentary constituency. He went to Japan and hugged there, went to Pakistan and had Biryani, went to China and hugged but have you ever seen him hugging any poor family of Varanasi," she added. Priyanka also launched a direct attack at Prime Minister Modi by alleging that he repeatedly mentions her family but doesn't talk about his own work. "When he is out to campaign, he cannot tell us a single achievement of his. He has some issues with our family and can only say that Nehru did this and Indira Gandhi did that, I want to ask Modi Ji, tell us what exactly did you do?" Priyanka said. She also asserted that the promises being made by politicians are not a favour to anyone but actually it is the rights of the people. "If some politician comes forward and makes some promises, remember that it is your right and not a favour from anyone. Democracy means governance is yours and you are capable of making choices for your future," said Priyanka. She also alleged that the people who are in the government for the five years have forgotten that governance is for the public. "And you have allowed them to forget it," she said to people. In Ghaziabad, Priyanka was campaigning for Congress candidate from Ghaziabad parliamentary constituency Dolly Sharma. People kept showering rose petals from roof-tops at different places as she kept waving and greeting the people lined on both sides of the road as well as on the roofs of different houses and shops.